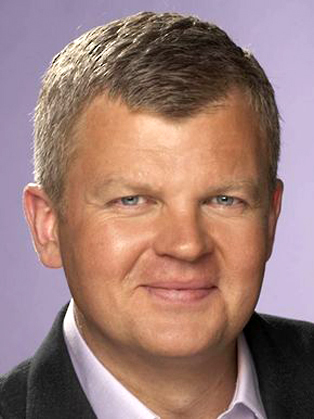 Born in Birmingham, Adrian Chiles is one of television’s most versatile and sought after presenters. He fronts ITV1’s football coverage (including the UEFA Champions League, FA Cup, UEFA European Football Championship, World Cup and all home England internationals) and is currently filming a third series of his successful That Sunday Night Show, also for ITV1. Adrian co-presented Daybreak with his long-time on-screen partner Christine Bleakley in 2010 and 2011. He launched The One Show (BBC One), Match of the Day 2 (BBC Two), The Apprentice: You’re Fired (BBC Two) and Working Lunch (BBC Two), and also presented several one-off documentaries and documentary series for the BBC including: Asian Millionaires (BBC Two), Working in the Dark (BBC One), So What Do You Do All Day (BBC Two), It Beats Working (BBC One), Royal Millions (BBC One), and What Ron Said (BBC One). As a radio presenter Adrian has worked on Financial World Tonight (BBC Radio 4), Wake up to Money (BBC Radio 5 Live), and 6-0-6 (BBC Radio 5 Live). His former radio show, Chiles on Saturday (BBC Radio 5 Live) won a Sony Radio Academy Gold Award in 2002.